You are here: Home › Blog › AutoDesk Inventor Training – Inventor Studio – Migrate Data part 4. Last part! AutoDesk Inventor Training – Inventor Studio – Migrate Data part 4. Last part! Welcome back; this is part 4 of my AutoDesk Inventor Tutorials (Inventor Studio) series on how to migrate material / appearance data from previous versions of AutoDesk Inventor. Why would you need to learn this? 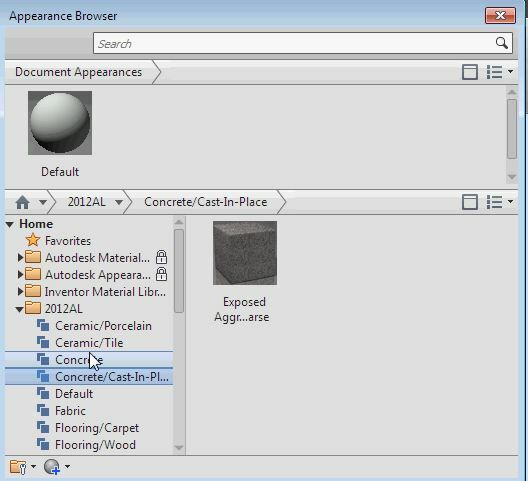 Well, when you’re busy and proficient with designing, you’ll definitely want to save your custom materials and appearance settings so you can bring them with you to the current version of AutoDesk Inventor. 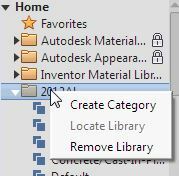 In my last post, we had migrated our material library and had started to migrate our appearance library from Inventor 2012’s design data. 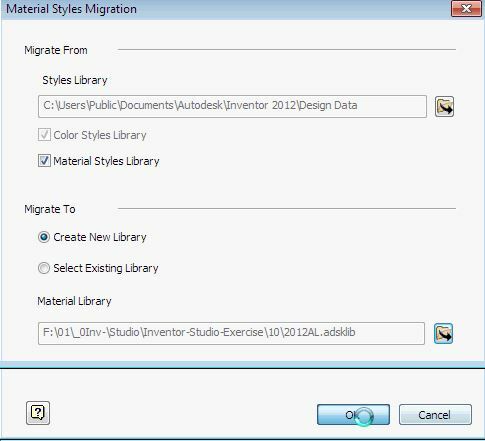 Once you’ve typed in the name of your new library (this doesn’t have to be an existing file; Inventor will create it for you), you click Save, and are returned to the Material Styles Migration window, where you can click OK, as shown below. You’ll see the paths of your “to” and “from” libraries in the grayed-out fields of this window. You’re automatically taken back to the Appearance Browser. Let’s expand the library node for 2012NL. As you can see, our migration was successful and we have many appearances now available for use. Let’s click the red X in the top corner to close the Apperance Browser. Now, let’s learn how we can delete our libraries. This is of course very easy! From either the Material Browser or the Appearance Browser, just right-click on the library node you want to delete; this is in the panel on the left side of the window–that’s what I’ve got excerpted below. A contextual menu pops up, allowing you to Create a category or Remove Library. To delete, just select Remove Library and it’s gone! This doesn’t delete the actual data from your computer; you can still bring it back in from your Inventor 2012 Design Data if you need to. But it’s not available to you any more in this version of AutoDesk Inventor.